The drop test or water test is one of the favourite hobby of the mobile phone geeks, specially when it comes to flagship phones of the major manufacturing companies. I saw a test of Samsung and Apple left to freeze in ice and the both mobiles seemed to be working. 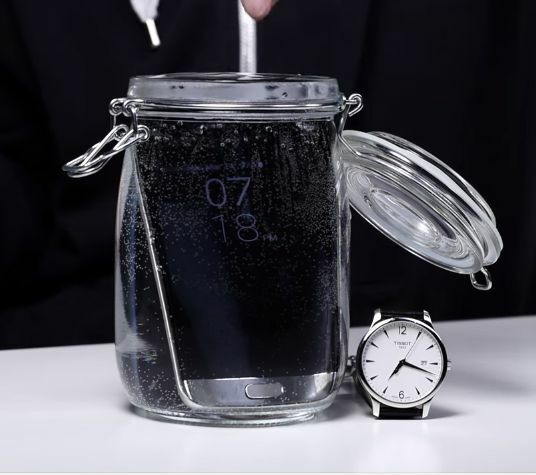 Now here is a water test for the Samsung Galaxy S7 which remained submerged into a glass of water for good about sixteen hours. Although, the test is very basic as submerging a phone inside a glass of water does not have weight of water over it as in case it drops into a pond. But nevertheless, the test is interesting and better be watched in a video shared at YouTube.